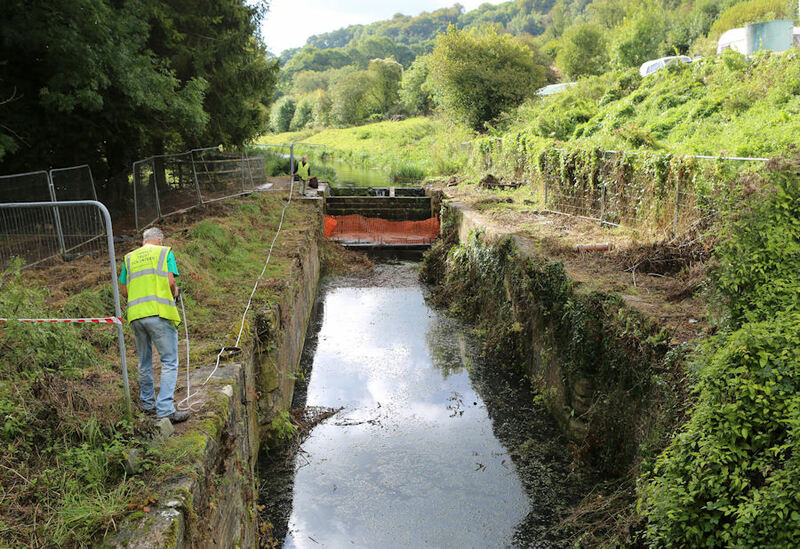 The volunteer led restoration of Ham Mill Lock Chamber is now complete! Over 12,000 volunteer hours have been recorded since work started on the Grade 2 listed structure in November 2014. A group of over 100 Cotswold Canals Trust volunteers with backgrounds as diverse as electronics engineers, chemists, publishers, plumbers, teachers, lorry drivers and civil servants have become a group of bricklayers, fitters and labourers. Below is evidence of what such a group can achieve. 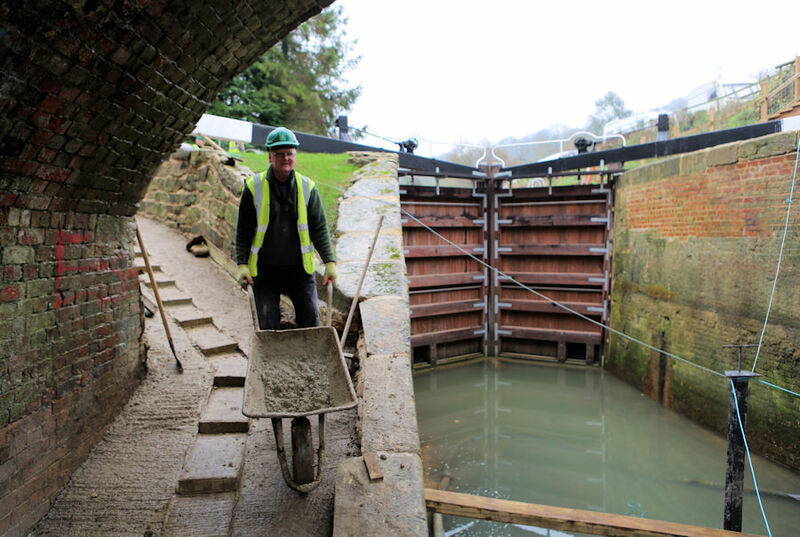 The volunteers have continued to develop skills and experience gained in the restoration of three previous locks. Substantial areas of the chamber’s failed brickwork have been replaced by the team who have laid 12,500 bricks using a very large amount of mortar! Gates, paddle gear, safety ladders and by-wash have been installed. 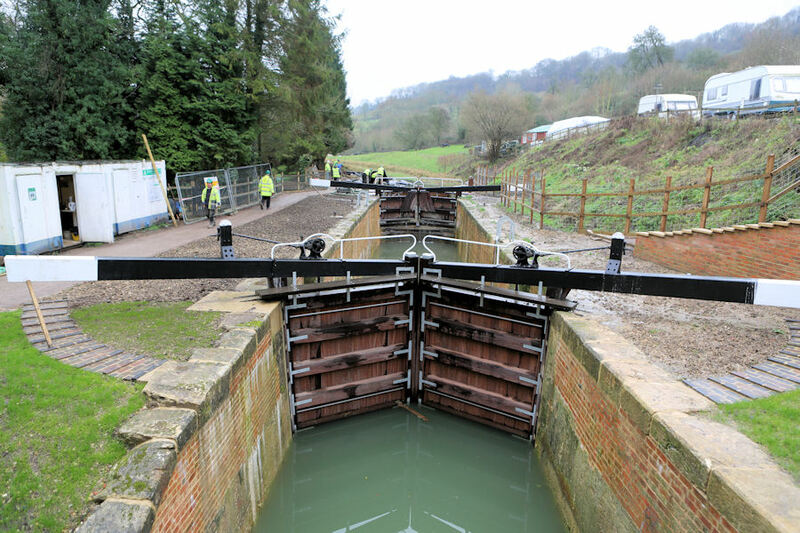 The towpath around the lock has been rebuilt with the same system and materials used by the Stroud District Council Towpath Volunteers on the rest of the canal. The answer is, the residents of the property overlooking the lock keep a flock of white coated goats… very inquisitive and active goats they are too! It is hoped that these agile and adventurous animals might embrace the voluntary ethos by keeping the steep grass bank, on their side of the fence, neatly cropped. Beneath and beyond the bridge a large amount of material, and a redundant gas pipe, was removed to achieve the lowering and re-profiling of the towpath. This work enabled restoration of the towpath to its original level revealing coping stones, laid in the 1700s, to be in excellent condition. The narrow access meant that all the material had to be removed by wheelbarrow. The soil was re-used in the landscaping of the lock side. The curved slope leading up to the lockside from under the bridge was re-profiled. Volunteer Will Foster came up with an innovative design to enable this steeper part of the towpath to be utilised more easily by walkers, cyclists, wheelchair users and baby-buggy steerers. Will explains…“Whilst removing the old gas pipe from the towpath created a lower level and increased the pedestrian headroom under the bridge, it also made the towpath steep enough to create a problem for some users. It occurred to me that adding small steps (slightly offset from centre) within the width of the concrete towpath would help wheelchair users and increase steadiness for all users in poor weather conditions. “Ham Mill is one of the few — only? — parts of the canal where towpath users must go under the bridge, there is no alternative route. The slope is now in use and we have been pleased by people’s positive comments”. Throughout all the activity the towpath remained open. 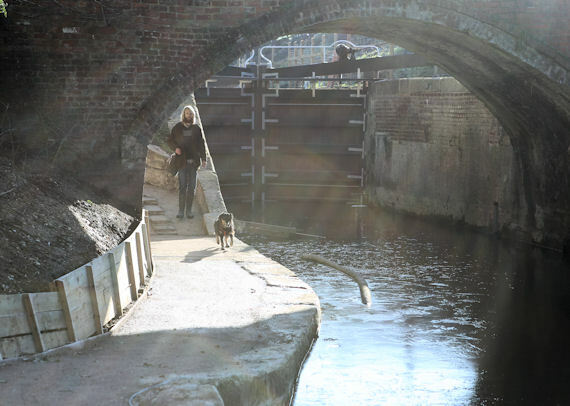 The daily passing of local residents meeting and chatting to the volunteers has led to a number of those local people joining the happy band of lock restorers.